What is the relationship between the Russian imperial house and the Russian Orthodox Church and other traditional religious confessions in Russia? The relationship between the Russian Imperial House and the Russian Orthodox Church is warm and mutually supportive. As a devout and faithful daughter of the Church, Grand Duchess Maria of Russia has enjoyed a close and filial relationship with His Holiness, Patriarch Kirill I of Moscow and All Russia, and with his predecessor, Patriarch Alexis II. The Church, for its part, has declared its recognition of Grand Duchess Maria as the legitimate Head of the Russian Imperial House. "[I]n the person of Grand Duchess Maria Wladimirovna and her son, George, the succession of the Romanoffs is preserved—no longer to the Russian Imperial throne, perhaps, but certainly to history itself.…Maria Wladimirovna supports a great many good initiatives, she makes visits Russia, she meets with people, she raises ordinary people who have in various ways distinguished themselves to noble status, and so on. I remember very well how, when she was visiting Smolensk, she elevated to noble status an old peasant woman who had done much for her neighbors during the difficult years of the war and immediately after the war. Thus the cultural contributions of this family continue to be very significant in our society." "For many of our countrymen, the Imperial House, of which you are the Head, is a symbol of a connection across generations and of the continuity of the spiritual and cultural foundations of our nation. It is so very gratifying that, despite living outside of Russia, you have remained loyal to your historical homeland and to your Mother Church and have striven to preserve the traditions that were established by your ancestors. In engaging in social activities, in meeting with people of divergent views and beliefs, you are making a genuinely meaningful contribution to the strengthening of the unity of the Russian community. I would especially like to note the fruitful partnership between the Imperial House and the Russian Orthodox Church, visible proof of which was the joint celebration of the 400th anniversary of the ending of the Time of Troubles and the ascension of the Romanoff dynasty." Thus the current relationship between the Russian Imperial House and the Russian Orthodox Church is close, warm, mutually supportive, and rooted in history and a spirit of Orthodox piety that has characterized the Russian monarchy for centuries. Grand Duches Maria visits the Cathedral of Our Lady of the Sign in New York in December, 2013, for the 400th Anniversary of the House of Romanoff. The legitimate Heads of the Russian Imperial House since 1917 have all enjoyed a close relationship to the Russian Church. Grand Duke Wladimir Kirillovich counted many hierarchs of the Russian Orthodox Church Abroad (Russian Orthodox Church Outside of Russia) as personal friends and confidantes, and St. John (Maximovitch) of Shanghai and San Francisco was an ardent legitimist, commemorating in every service he officiated Emperor de jure Kirill Wladimirovich and Wladimir Kirillovich, and writing an important treatise on the origins of the system of succession to the throne in Russia. From the fall of the monarchy in 1917 until the collapse of the Soviet Union at the end of 1991, each successive First Hierarch of the Church Abroad formally recognized first Emperor Kirill and then Grand Duke Wladimir as heads of the dynasty. 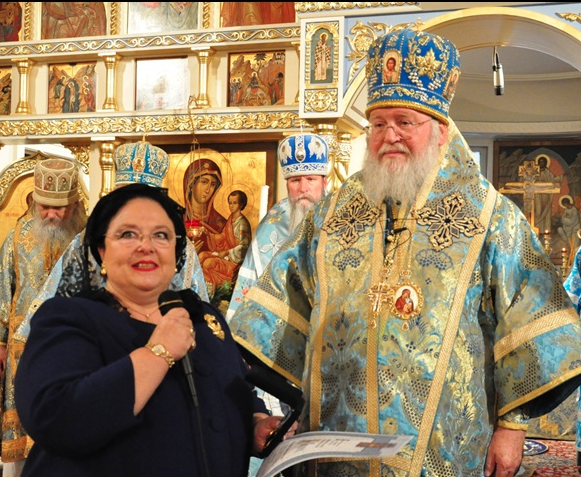 The strong legitimist tradition in the Church Abroad came again into plain view with the visit of Her Imperial Highness to the United States in December 2013, when Archbishop Kirill of San Francisco and Western America—the archiepiscopal successor of St John in the See of San Francisco—accompanied the Grand Duchess during the length of her stay, served commemorative services on behalf of her father and grandfather and for the health of the Grand Duchess, and spoke at length and publicly about the Grand Duchess’s collaborative projects with the Church, about her many charitable activities, and about her devotion to Holy Orthodoxy. The Grand Duchess visiting Ulan-Ude, Buryatia, at the side of the Khambo Lama, leader of the Buddhist community in Russia, whom she presented with the Order of St. Stanislas, 1st Class. The Grand Duchess also respects and celebrates the religious diversity of her native Russia. She has made numerous trips to regions of Russia that are populated predominantly by non-Christians, including Ingushetia, Tatarstan, and Uzbekistan, which are predominantly Muslim, and Buryatia, which is home to many Buddhists. She has called for religious toleration and inter-confessional dialogue, and has stressed on many occasions how Russia is home to peoples of many languages and religions. During a meeting with Mufti Issa Khamkhoev of Ingushetia, she proposed the creation of a series of centers for inter-confessional dialogue across the Russian Federation, and in her meeting with the Speaker of the Khural—the representative assembly for the Buryat Republic—the Grand Duchess remarked how the religious climate in Buryatia might serve as a model for religious tolerance across the world, pointing out that the Orthodox and Buddhist population of Buryatia have for centuries lived together in peace and friendship, and that the religious leaders of both traditions have always made every effort to make sure that their religious differences never became a pretext for conflict or mutual distrust.